Often bundled with Canon EOS 5D models as a kit, the original model was regarded as highly-versatile lens for stills, and particularly favored by video enthusiasts for its parfocal-like qualities. 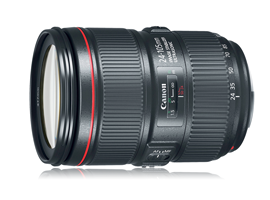 Promoted by Canon as a one-lens solution, the upgrade features a refreshed optical construction with a total of 17 elements arranged in 12 groups, and a minimum focus distance of 1.48’ (45cm). Although the new lens no longer features any UD glass, four of its elements are glass molded aspherical types. These help reduce chromatic and spherical aberrations, and lower distortion, while at the same time keeping the design smaller and lighter than exclusively spherical designs. In addition to fluorine and Air Sphere Coating, the construction also integrates a 4-stop stabilizer, up from the predecessor’s 3-stop unit. It also has no fewer than 10 diaphragm blades for a more circular opening and for potentially more pleasing-looking blur and out-of-focus points of light. Like its predecessor, the new lens has a ring-type USM for autofocus and is both dust- and water-resistant. The new model features a 77mm accessory thread, measures 3.29 x 4.65” (83.5 x 118mm), and weighs a little more than the original at 28.04 oz (795 g). It is available now for around $1,199 (USD). With an overall score of 24 points and a sharpness score of 14-Mpix, the new lens is a good performer, all things considered, but that sharpness score is a little lower than what we’ve come to expect recently from Canon. Looking past the scores for a moment, this new lens has very good-to-excellent sharpness across the image field at all focal lengths. It also has outstanding control of lateral chromatic aberration, excellent transmission, and relatively low distortion and vignetting. As always, we’ll start by comparing the new lens with its predecessor, and also with the relatively new (2014) Canon EF 24-105mm F3.5-5.6 IS STM, which retails well under the L-series models at around $600. Given Canon’s preoccupation with improving sharpness levels for their high-resolution bodies, the lower peak sharpness figure for the new lens is a surprise, but there’s more to lens performance than outright sharpness — just look at the figures for transmission and chromatic aberration. 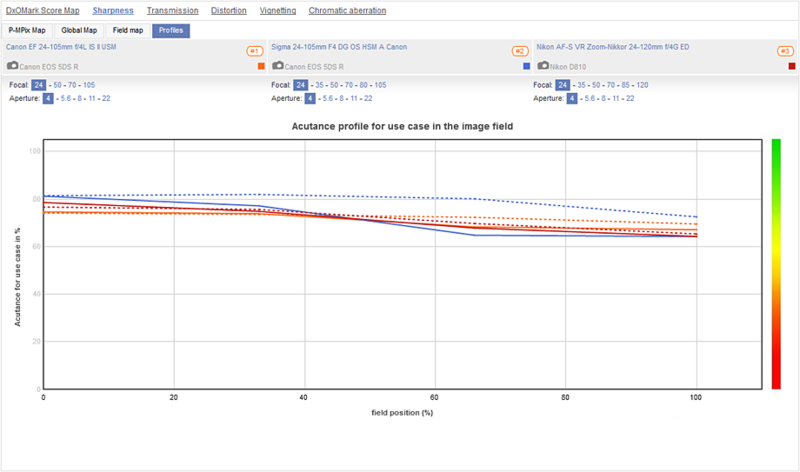 That said, based on our results, it looks as if Canon wanted more uniform sharpness across the field. Like the original, this lens still performs strongest at 24mm, but it forgoes center sharpness for improved sharpness at the periphery, which of course results in more uniform sharpness across the frame. The same holds true throughout the zoom range; however, at 70mm and at wider apertures, sharpness is lower than that for either its predecessor and for the non-L STM model. Sharpness increases again at 105mm, and while the center isn’t sharper than the original, there have been gains in the outer field. That said, neither L-series models can match the peak sharpness of the STM lens, though the STM model has much higher levels of chromatic aberration. Sigma has been quick to see the appeal of the 24-105mm and is the only third-party maker to offer a full-frame model as an option for Canon users. At around $900, it’s some $200 less than the Canon. We’ve also compared the new model with the Nikon equivalent — the AF-S Nikkor 24-120mm F4G ED VR from 2010, albeit on the lower pixel-count Nikon D810. Like the Canon and Sigma, the Nikon lens is stabilized and offers a wider zoom range, of course, at a slightly higher price of around $1,300. 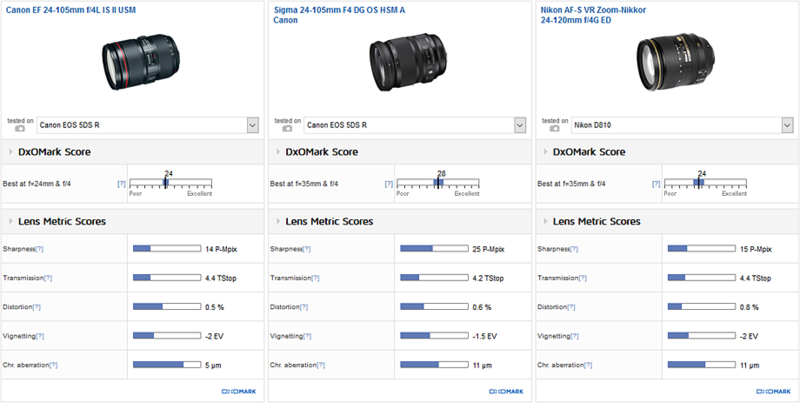 Despite the potential for higher sharpness, the Nikon performs similarly to the new Canon, having generally very good optical performance through much of the zoom range. Like the Canon, it also has a loss of sharpness combined with some symmetry issues at around the 70-85mm mark. 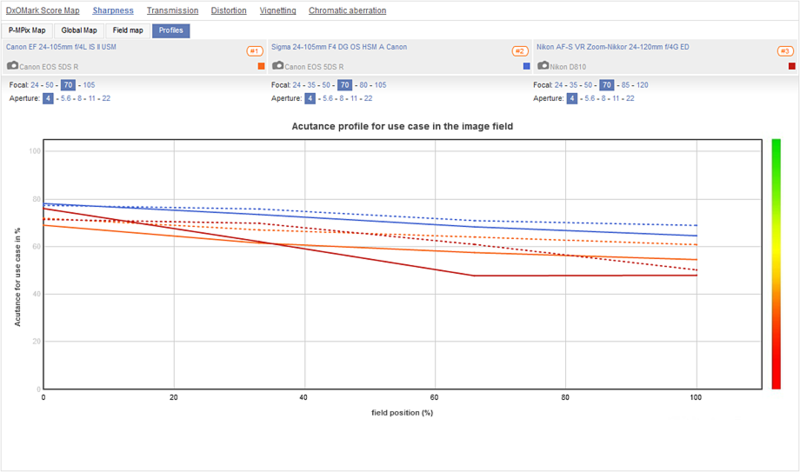 Even the Sigma can’t escape without some astigmatism; however, it occurs at 24mm, where the high sharpness levels at that focal length tend to overshadow direct comparisons between scores. While the effect likely lends some subjective character to images, it contributes to a lower overall score, just as with both the Canon and Nikon lenses. The Sigma also has significantly higher levels of chromatic aberration than the new Canon, but it has better transmission and controls vignetting well. 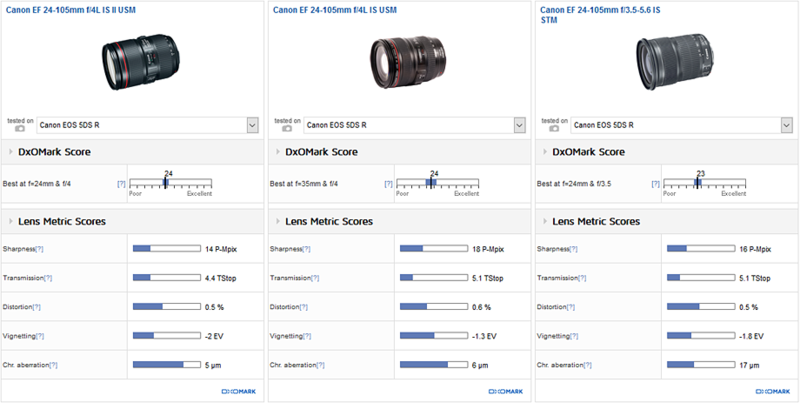 If high sharpness is your only objective when buying a lens, then the scores achieved by the Canon EF 24-105mm F4L IS USM might be a little discouraging. Looking on the bright side, however, Canon has improved sharpness in the periphery at all focal lengths, even if that’s at the expense of some sharpness in the center. Whether that’s clearly better is open to debate, but in optical performance Canon can be praised for high transmission and for maintaining low levels of lateral chromatic aberration (fringing is lower than many high-grade primes). 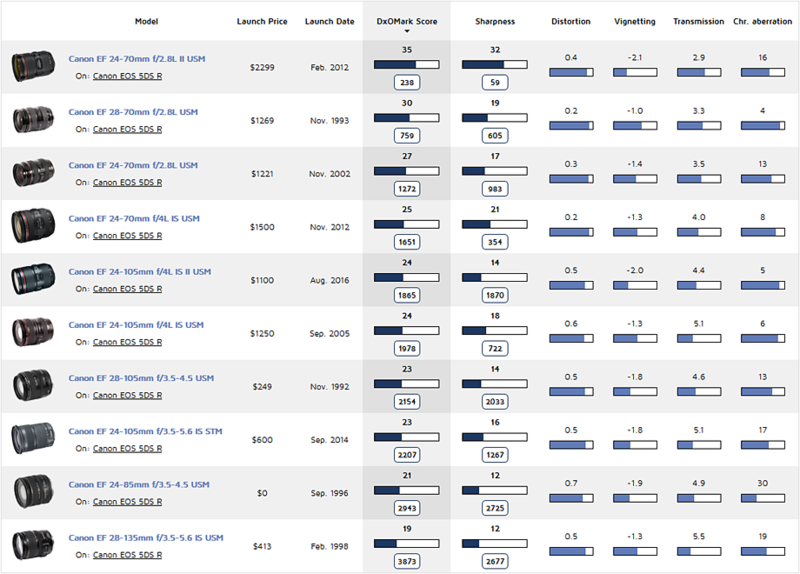 Sure, we would have liked to see peak sharpness leap up, but then the price hasn’t sky-rocketed either. Optical performance is just one aspect of lens design, and this update still feels like more than just a step in the right direction.